FREE & EASY Gift Cards! Walmart, Target, Amazon, Sephora & SO MANY MORE! Shopkick is my favorite app right now! It’s fun, It’s easy and It’s rewarding, literally! My mom has gotten $200+ worth of FREE Sephora Gift Cards with Shopkick! You earn points (they call them kicks) to redeem for FREE Gift Cards and Rewards just for walking into stores! 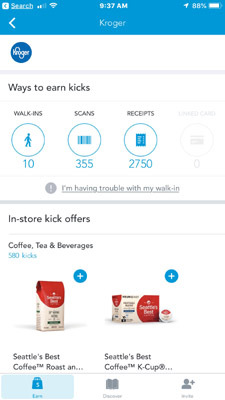 You can earn additional kicks for scanning bar codes on specific products, referring family and friends and linking your credit card to earn kicks for purchases. 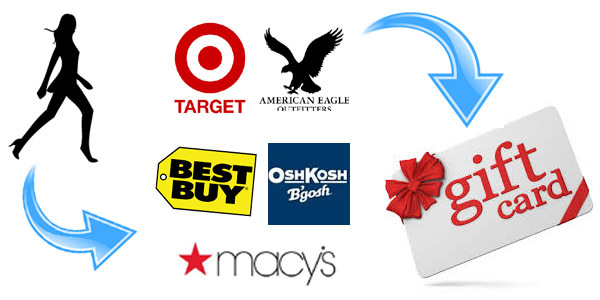 Redeem kicks for FREE gift cards from Target, Walmart, Best Buy, Old Navy, JCPenney, Starbucks, Macy’s, Lowe’s, Sephora and more! Go to the mall. You can earn kicks for a store “walk-in” and there are quite a few participating stores that are located in malls. Quite often, you can just stand in the entrance and not actually walk in the store. These do not require any purchase whatsoever. Just make sure that your app is open on your phone and that you have location services enabled. That’s a total of 305 Kicks alone – enough for a FREE Gift Card just for walking into stores! Go to Kroger and earn over 350 kicks … JUST FOR SCANNING PRODUCT BAR CODES! Have the kids help with bar code scanning! Get MAJOR Kicks for Purchasing products! In the photo above, you can earn 2750 for purchasing eligible items (like Seattle’s Best Coffee) and uploading your receipt. Currently, you will earn 50% of the kicks that any referral earns in the first 2 weeks, up to a total of 2500 kicks for every successful invite, up to 100 invites! That’s a potential 250,000 kicks! NICE! You can “cash out” after earning as little as 500 kicks for a FREE $2 Walmart Gift Card. So if you ONLY walk into the stores above AND scan the eligible product bar codes, you’ll get a FREE $2 Walmart Gift Card! Note – all rewards were current as of this posting and are subject to change at any time.